Hundreds of Upper West Siders flocked to a Town Hall Meeting on Wednesday, May 3, to learn about plans to develop the tallest building in Manhattan north of 60th Street – right here on the Upper West Side – at 200 Amsterdam Avenue. Zoning consultant George Janes shared his critical examination of the plans, which he believes were improperly approved by the Department of Buildings (DOB) last month. With the support of LANDMARK WEST!, the Committee for Environmentally Sound Development, Council Member Helen Rosenthal, and many others in the community and beyond, Janes is filing an official Zoning Challenge to compel the DOB to review the permits and reconsider its approval. See George Janes’ presentation HERE. Read related coverage of this proposal from CRAINS New York. 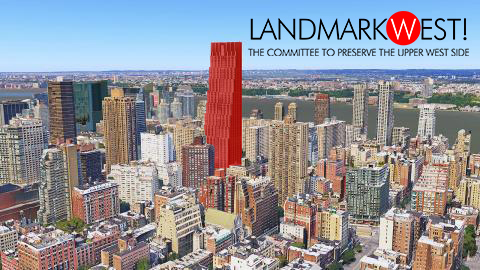 And catch up on news of another tall tower threat to West 66th Street HERE.